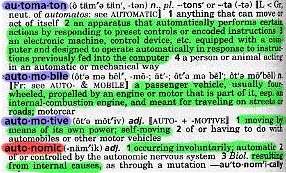 "Automobile-wheeled vehicle propelled by an engine..."
"Automotive-moving by its own power..."
"Autonomic-occurring automatically by internal control..."
That's it! Auto-nomics! "Vehicles moving under their own power, controlled automatically by computers." Well, it was new and different, anyway, so it stuck. The Auto-nomics organization came about as a result of events occurring over the space of a few of years, involving the demise of the late AirSensors, Inc., and a need for continued support by the many AirSensors systems users. Today, after consolidating much of the remaining inventory, Auto-nomics is proud to provide components, systems and services relating to AirSensors and other Electronic Fuel Injection solutions. Our goal is to continue to serve the needs of the owner, installer or maintainer of AirSensors and other products, with timely information and quality components, at fair prices. Our business is also our hobby, and we enjoy the sharing of ideas and information with other enthusiasts. Most of our transactions are conducted under the old-fashioned hand shake agreement, and customer satisfaction is our objective.